Curl up on a quiet Sunday afternoon with your family on this vintage taupe 6 piece power reclining sectional sofa. It includes three power reclining pieces, an armless chair, a console with storage and hidden cupholders, and a corner wedge. You can even charge your devices on the convenient USB chargers. Sit longer and feel better with the lumbar support. It's constructed using the strongest seat box in motion furniture, so you'll have peace of mind when your children are at play. Made in the USA. 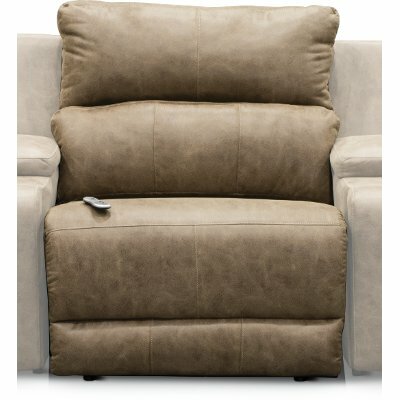 Vintage Taupe 6 Piece Power Reclining Sectional Sofa - Dazzle is rated 2.0 out of 5 by 1. Rated 2 out of 5 by Addictedtofurniture Not comfortable Purchased this the same week it supposedly hit the showroom floor. Liked that it wasn't leather since my family complained about the coldness of the leather of our previous couch. I have waited for 5-6months for the cushions in the head area to get more comfortable but it makes your neck hurt. Also the cushions are already getting squished down in the primary seats we sit in to view the television. Not sold on this couch especially for the price.